Blossom was a fitfully amusing NBC sitcom that ran for five seasons in the early ’90s. 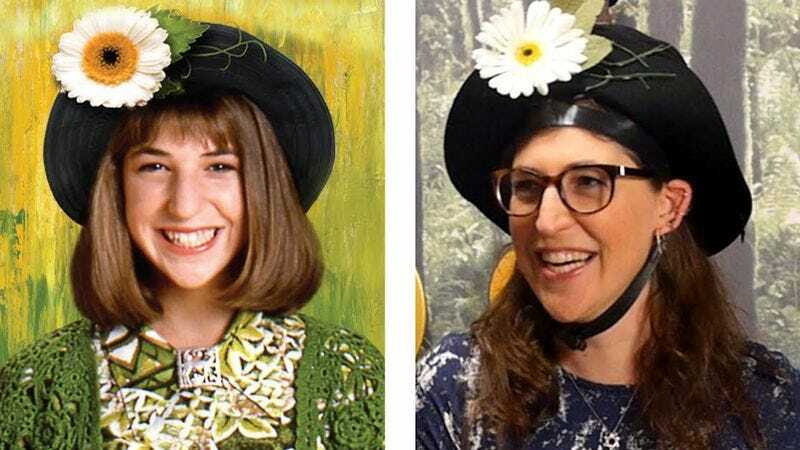 It starred Mayim Bialik—currently of CBS’ Big Bang Theory—as a quirky, suburban teenager coming of age in a house full of men, though it’s essentially remembered for two things: a dude who said “whoa” and hats. Blossom is credited with popularizing the floppy hat, namely ones with huge, garish flowers on them. Bialik, like most of America, eventually outgrew the trend, but a recent episode of Good Mythical Morning forced her to revisit her past as a fashion tastemaker. During a round of “What’s On My Head?,” a game that asks guests to guess what unconventional item is atop their noggin, hosts Rhett and Link bucked convention by actually putting a hat—with customary flower—on her head. It isn’t long before Bialik seems to figure out where this is going—one can only assume this is a joke she’s heard before—but, hey, it fits her well, even to this day. Scroll up about 11 minutes for the big reveal below. Now, if only somebody could get Joey Lawrence to muse on how his “whoa” might resonate in the age of social media? Oh, wait.